Contest: Yamaha - Win an FG-TA TransAcoustic Guitar! 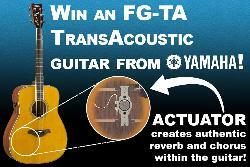 Yamaha - Win an FG-TA TransAcoustic Guitar! Prize: PRIZING There is 1 Grand Prize available consisting of a Yamaha FG-TA TransAcoustic guitar. Grand Prize has an approximate value of $749.99 CDN. Statistics: This contest was opened by 89 and entered by 13 ContestChest.com members. 15% of those who opened the contest, entered it.